In a medium sized bowl, combine the chicken breasts, pesto, salt, and pepper tossing together until the chicken is coated in the pesto. Cover the bowl with plastic wrap and let the chicken marinate in the refrigerator for at least 30 minutes or overnight. Grill or sautè the chicken for about 3-4 minutes per side depending on the thickness of your chicken. Remove the chicken from the heat and let it rest for 5 minutes before slicing. Heat a large skillet over medium high heat and spray with cooking spray. Add in the spiralized zucchini along with some salt and pepper to taste. Toss everything together and heat through for about 1 minute. Remove from the heat and divide into two bowls. 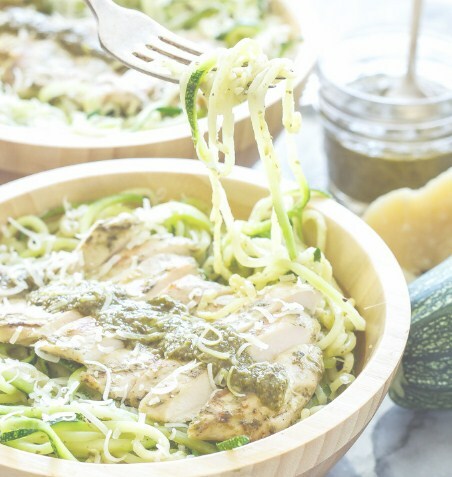 Top the noodles with the sliced chicken, more pesto, and shredded parmesan cheese.